ASTEROIDS (AND DWARF PLANETS) - WHERE ARE THEY ? The date for which the values of the above elements are valid. Below are the results of your request from the Minor Planet Center's Minor Planet Ephemeris Service. Ephemerides are for observatory code J77. 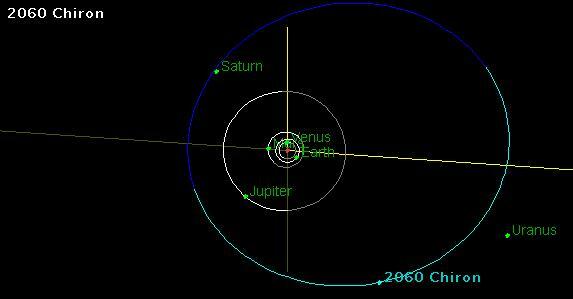 To see this visit the JPL Small-Body Database Browser page, search for '99942' and call up 'Orbit Diagram'. Adjust the view to ‘edge-on’ by going to the Menu listing and selecting 'Look from: Ecliptic'. Classical EKBOs have semi-major axis between 42 and 48 AU and are sometimes referred to as Cubewanos, the first such object discovered being 1992 QB1 (15760). They occupy various resonances with Neptune i.e. ; 5:3, 7:4 and 2:1. SDOs , or Scattered Kuiper Belt Objects, are asteroids in highly eccentric orbits with semi-major axes greater than 48 AU. 1996 TL66 (15874) was the first of these to be discovered. For more details, diagrams, etc. see here.